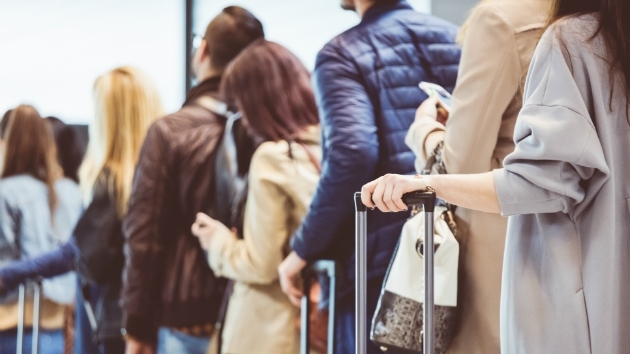 You might be anxious about losing your luggage or making a connecting flight, but don’t let holiday travel become something you dread. With some planning, you can survive the traveling frenzy without feeling frantic. (NEW YORK) — From standstill traffic to airport security lines that never seem to end, travel stress during the holidays is nothing to ho, ho, ho about. Save time and hassle by checking into your flight online. You won’t have to deal with those check-in kiosks and can skip a few lines just by printing out your boarding pass at home or sending it to your email. If you’re not checking luggage, you can skip the check-in lines entirely and head straight for airport security. If you are checking luggage, travel experts say try curbside check-in before heading inside the airport. If you’re driving this holiday season, remember to be patient once you hit the road. Apps like Maps.me and OsmAnd have traffic features to get you on the fastest route available. Both work offline so you don’t have to worry about losing internet connection in some of those more remote areas on your drive. If you’re headed to the airport, apps like GateGuru and iFly Pro provide real-time flight status updates and push notifications customized to your flight itinerary. Even if you’re not the type of person who wants to listen to music or watch movies for eight hours straight, a pair of noise canceling headphones can be a lifesaver to get some sleep and cancel out the noise of the toddler crying behind you. “This time of year is peak travel time for families and as much as we love children, there is nothing worse than sitting on a plane next to a crying baby,” said Christie Hudson, head of public relations at Expedia.com. Snap a picture of your bag before handing it over to an airline if you’re worried about losing it. That way you won’t have to stress trying to remember if your bag was black or dark blue and airline staff will know exactly what to look for. Travel experts also say it’s a good idea to tie a colored ribbon to your suitcase, especially if it’s a common color like black or brown. It’ll make it easy to spot your bag on the luggage carousel. Think about swapping a few essential items with a family member as well. Then no one will feel helpless if one bag doesn’t make it on time. If possible, schedule a fun activity for when you first arrive at your destination. A spa visit, massage or a nice meal will give you something to look forward to when you’re stressing at the airport. “Not only will it be great for when you get to your destination, but the anticipation could keep you relaxed you when you’re in the moment of traveling,” said Frommer. Consider planning something relaxing for your return home, too. Getting back to your house after a long trip with the relatives is tiring and it can be tough to get back into a rhythm of things. Do a 15-minute meditation, take a warm bath and relax with some time to yourself. Making sure you have time to recharge before diving back into your daily routine can make all the difference.